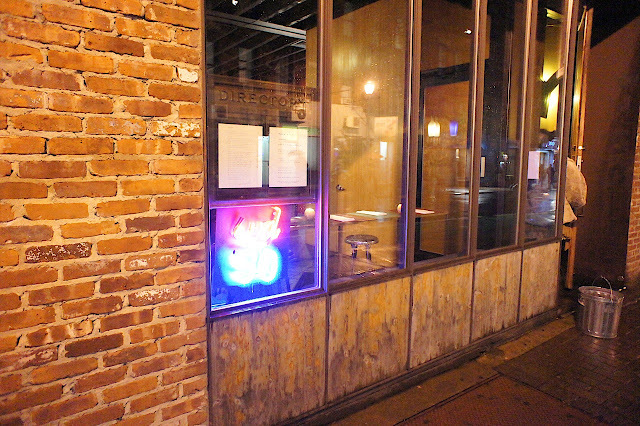 Update: WD-50 permanently closed in 2014 due to the real estate redevelopment of the area which included its premises. WD-50 is a one Michelin star restaurant on the Lower East Side on a rather grungy street. Named with the initials of the chef-owner, Wylie Dufresne, and the unit number of the premises (50 Clinton Street), it is known for Chef's Dufresne's innovative and sometimes bewildering culinary creations. A former prodigy of Jean-Georges Vongerichten (the celebrity chef with a string of successful restaurants in New York including the 3 Michelin starred Jean Georges), who is now also his business partner in WD-50, Chef Dufresne opened this restaurant in 2003 and gained his first Michelin star in 2006. The restaurant itself had an edgy looking entrance, looking more like a bar than a fine dining restaurant. The interior resembled a typical American diner and had a color scheme and table arrangement not dissimilar to Billy Bombers. A section of the tables was cramped in a row and diners practically had to eat elbow-to-elbow (very bistro-style), but fortunately we made our bookings early and were given a table for 4 (for the 2 of us) in the corner next to the kitchen entrance (which gave me a very interesting partial view of the kitchen throughout the dinner - Chef Dufresne was within my line of sight for the whole evening fussing over each dish being prepared in the kitchen). The waiters were very casually dressed in jeans and t-shirts and were very young, charming and chatty (ours, Matthew, looked like a young Don Draper). There was a choice of the a la carte menu as well as a tasting menu (which essentially was a selection of items from the a la carte menu). Given that this was a molecular gastronomy restaurant, we thought it prudent to go with the tasting menu (so as not to get stuck with a large a la carte dish which we thought was strange or didn't like). As it turned out, we made the right decision. The bread was an interesting flat and crispy sesame cracker (very much in the Italian style). We were served no other breads during dinner. 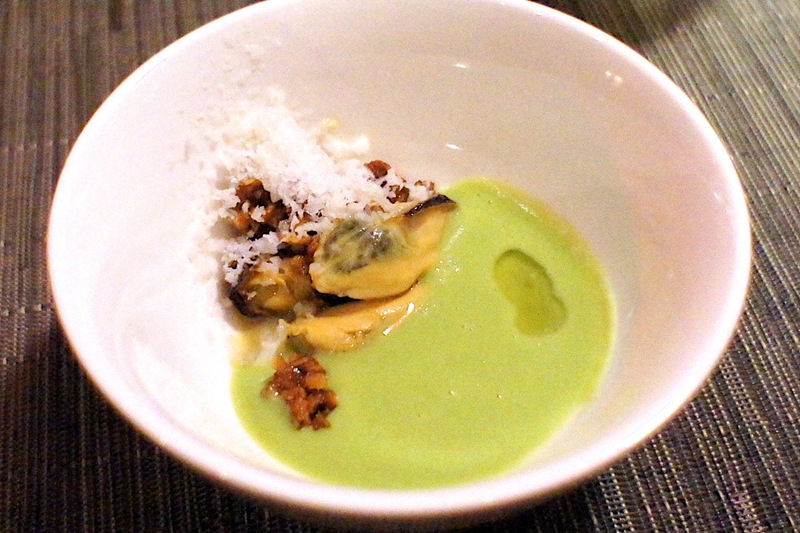 Pea soup, mussels, coconut water, curried granola: a rather strange and uninspiring start to dinner. The mussels and pea soup went well together but the strong cumin flavour of the granola was odd and the iced coconut water didn't add anything to the dish. 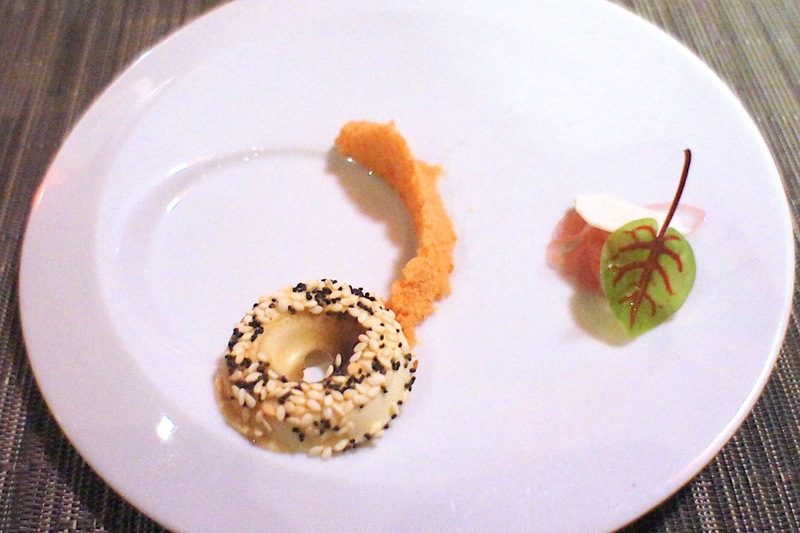 Everything bagel, smoked salmon threads, crispy cream cheese: the cream cheese ice cream and the sesame seeds, when eaten together, really tasted like a bagel but if we wanted bagel we'd just eat and actual bagel instead of this derivative. A bit showy we felt, without being special. 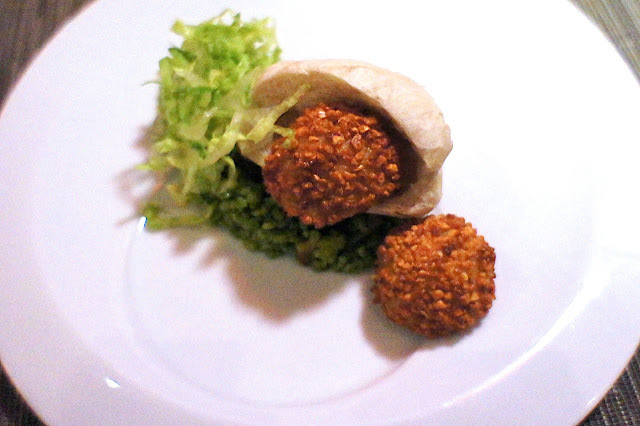 Foie-lafel: another derivative whereby the actual falafel would probably taste better. 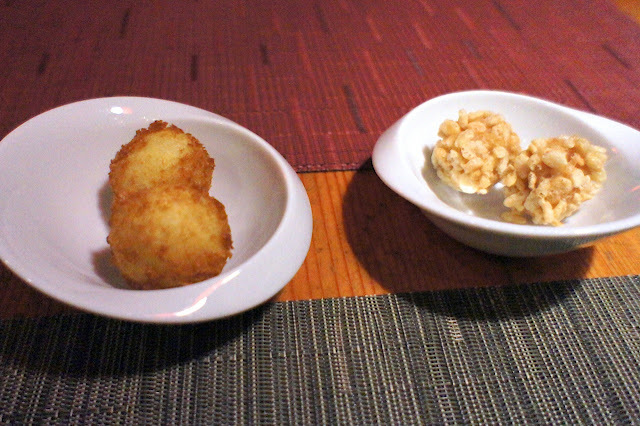 The crispy deep fried ball was supposed to contain foie gras but we couldn't really taste it. 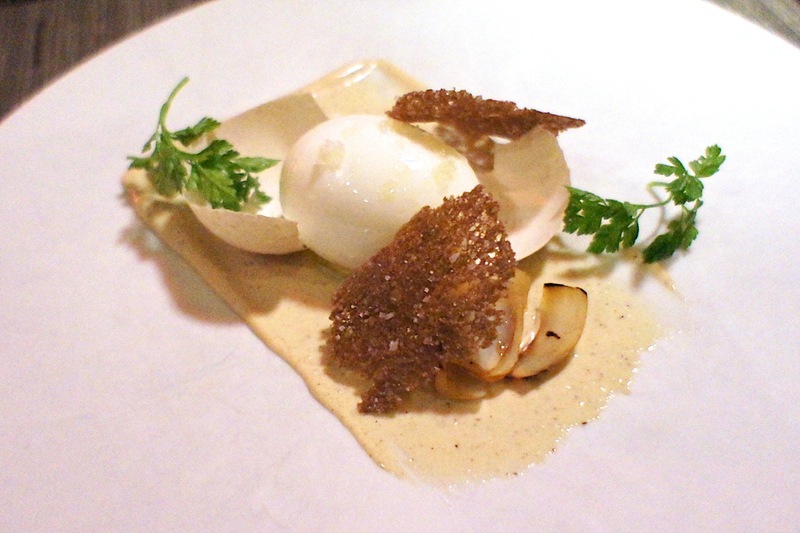 Poached egg in the shell, pumpernickel, caesar dressing, lily bulb: we really enjoyed this, as the egg was perfectly poached (though the egg whites were hardboiled) and the egg yolk oozed liberally after the egg was sliced open. 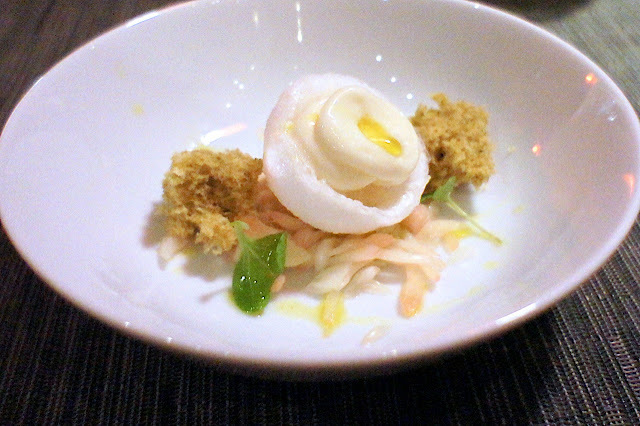 The egg shells were edible too but they were tasteless and served no purpose other than for show. 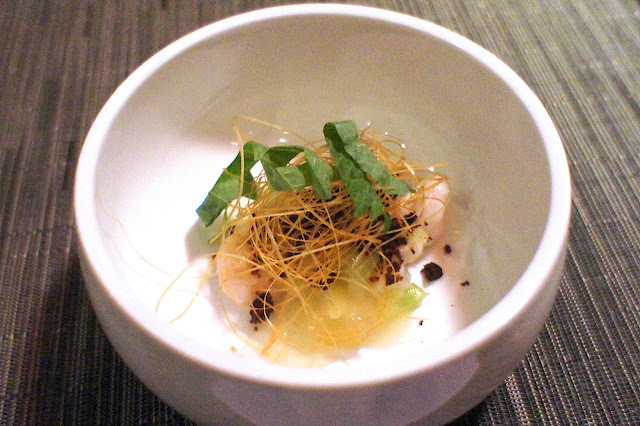 Rock shrimp, miso noodles, chicory, yuzu: this was a confused dish. We couldn't figure out what this was supposed to be and the individual ingredients didn't come together well at all. 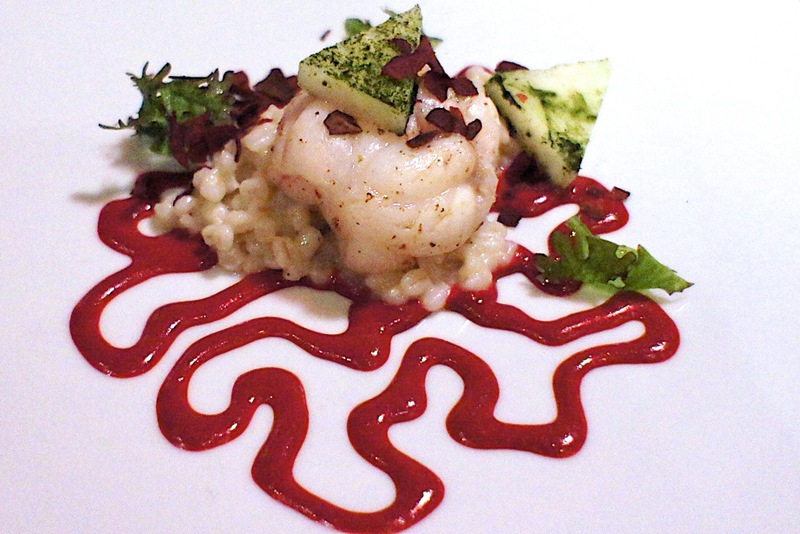 Monkfish, smoked barley, beet-mustard, nori: this was the best dish of the evening, both in its taste and its presentation. The monkfish was cooked to perfection; juicy yet firm. The beet-mustard sauce was surprisingly subtle and the barley was the perfect accompaniment. 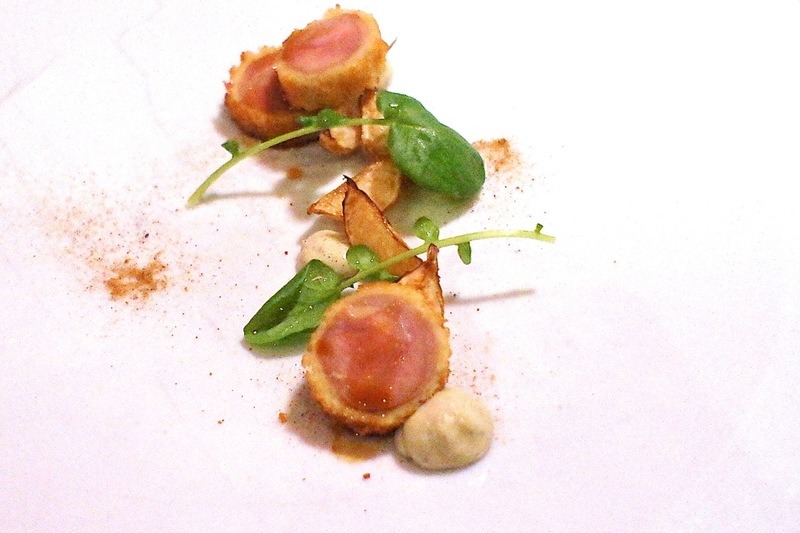 Quail, chartreuse yogurt, turnip, nutmeg: the quail was cooked sous vide and then deep fried for its breaded layer, and it was excellent, especially when eaten with the tangy yogurt. 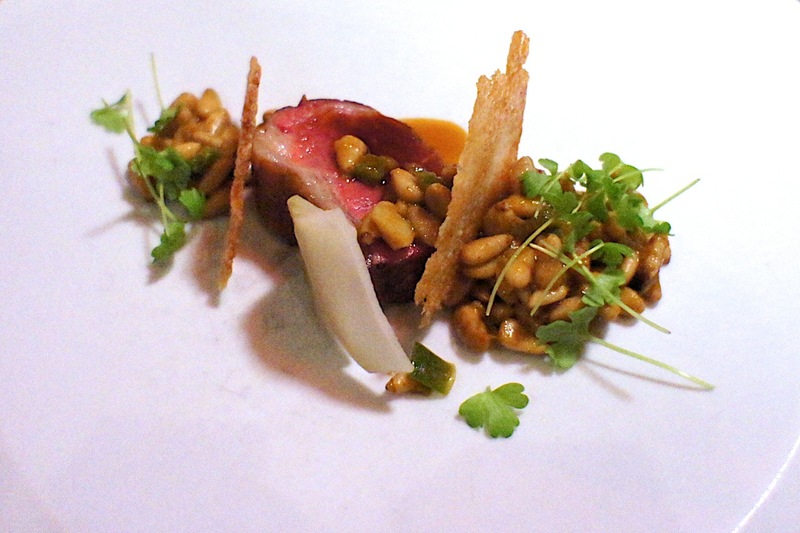 Lamb loin, 'red beans & rice', chayote squash: the lamb was cooked quite raw and was very tender. This was very classically prepared and was complemented well by the beans. 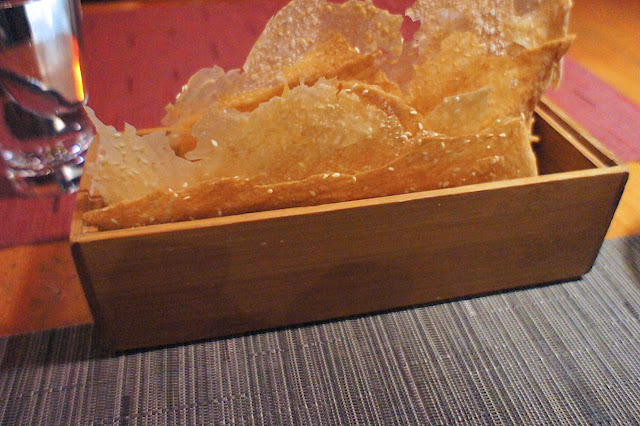 Menthol, ginger, pomelo, chamomile: this was an excellent pre-dessert, a combination of mint and ginger sorbet with a thin crispy sweet transparent shell, frozen pomelo pulp and dehydrated chamomile which came together very well. 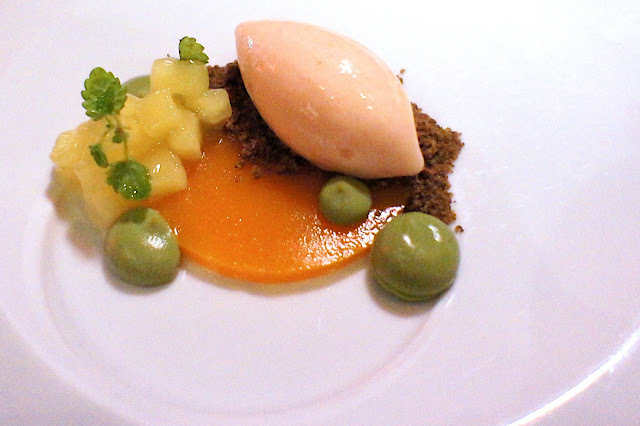 Apricot, buckwheat, quince, green tea: a rather confused dessert, where we felt that the apricot ice cream and the apricot quince overpowered the rest of the ingredients with their sourness. 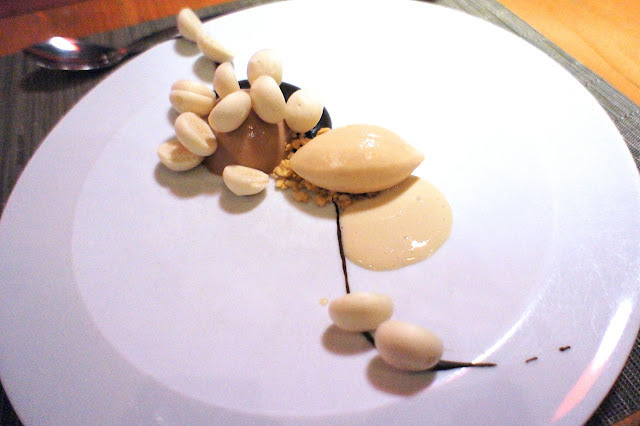 Milk chocolate, black bean, plantain, soy, peanut: this was like a deconstructed snickers bar with the various ingredients of milk chocolate ice cream, chopped peanuts and the black bean vinaigrette and plantain (a type of banana) ice cream which, when eaten together, reminded us of caramel. This would have been really good if not for the plantain ice cream being slightly too sour. Rice crispy treats: an appropriate end to an enjoyable meal. The one on the left was a hot deepfried lemon meringue ball and on the right was frozen rice crispies and peanut ball. 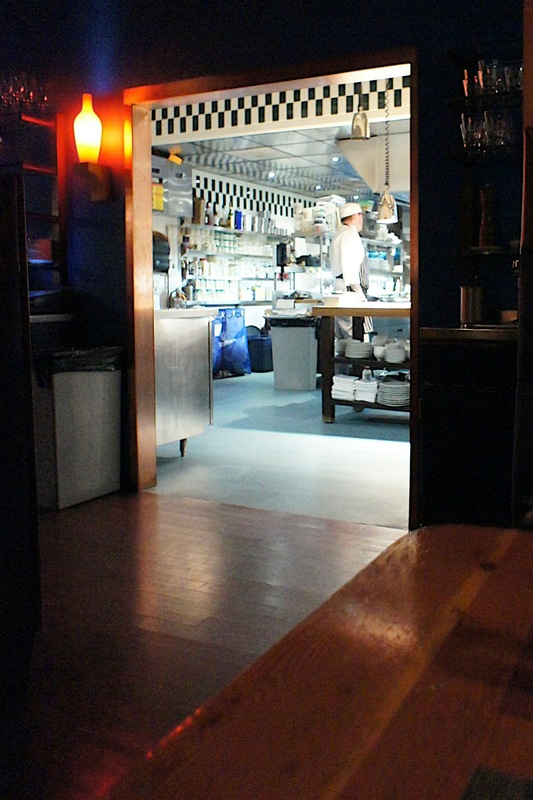 Final Thoughts: A very good meal at an interesting restaurant. Rarely would you find a Michelin star restaurant state its dress code as 'casual' but this was an unpretentious place with an energetic vibe and great service. After a slightly dodgy start to the meal (when the first few courses were more miss than hit), the mains were excellent and two out of three of the desserts were very good as well. We felt that food-wise, WD-50 shares many similarities with Andre in Singapore (see earlier reviews: Andre 1 and Andre 2) whereby some of the dishes (especially the appetisers) may be gimmicky but there is solid cooking foundation in the kitchen and this manifests itself in the proper execution of the main courses. 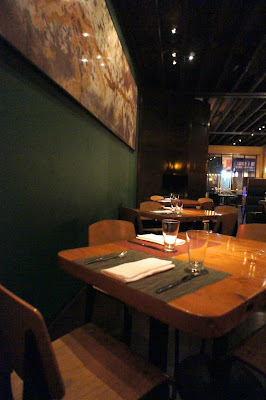 This is a good option for diners sick of stuffy french fine dining restaurants yet want to eat well.